All our trips and PADI Courses are guaranteed to go to the best outer reefs where the great visibility makes the reef. The dive boat Poseidon has exclusive access to the best dive sites of the Agincourt Reefs like Barracuda Bommie, The Nursery, Helms Deep and Turtle Bay. The Agincourt Ribbon Reefs are the best reefs in our vicinity. Teeming with underwater life the Great Barrier Reef is, without doubt, one of the truly great natural wonders of the world – and the very best way you can experience it is underwater – scuba diving off the Port Douglas coast in Blue Dive style. The professional yet friendly international team at Blue Dive are deeply committed to bringing you safe, quality and personal PADI scuba diving instruction and expert private guiding to beginners and experienced divers alike. All scuba diving trips go to the outer Great Barrier Reef on some superb vessels. It is worth checking that your trips is going to the best outer reefs when you book as some of the small dive boats cannot guarantee this. Please Contact us or email us with requests – snorkellers welcome on all trips. Our PADI courses and dive trips are mainly conducted on the excellent dive boat Poseidon – The best scuba diving in Port Douglas. We can also complete courses and privately guided introductory trips on the luxurious Calypso on the turquoise blue Opal Reef Complex or on the sleek and modern vessel AquaQuest. 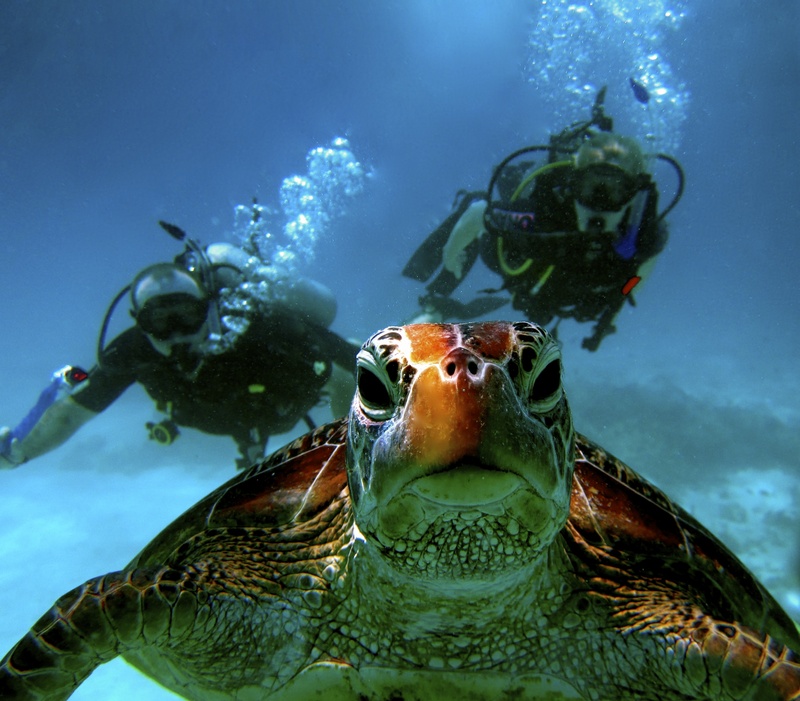 Book your own expert Blue Dive private guide to show you the best of the Great Barrier Reef. 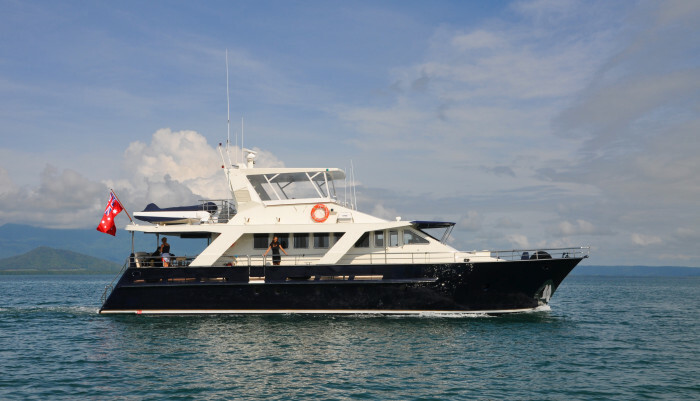 If you want to experience the ultimate way to see the outer Great Barrier Reef from Port Douglas then there is no better way than to take a Blue Dive luxury private charter on one of the top-of-the-range luxury small boats. The Great Barrier Reef Marine Park Authority – in their 2013/14 Reef Report – said that the Agincourt Ribbon Reefs were the “best and most pristine examples of coral reefs in the whole GBR”. Scuba Diving in Port Douglas is still superb. At Blue Dive we are proudly involved in several campaigns to defend the quality of the Great Barrier Reef. • Day dive trips to Lake Eacham – a volcanic crater lake surrounded by lush rainforest. 1. No mass diving at Blue Dive – no diving in other divers bubbles, enjoy the reef as it should be seen in your own small group. 2. Dive with the knowledge that you will be looked after very safely and that you are diving with the Premier Port Douglas PADI 5 Star Dive Resort. Blue Dive has assembled the most experienced, safety conscious yet fun and friendly team of professional dive instructors in north Queensland. 3. We have a policy of taking a maximum of 5 on PADI Open Water Courses and Advanced Courses as it means we can give expert and individual attention to each student – it’s a bit like the small school classes issue. It’s much, much better for the learning to dive experience. And we now have an on-line option for the theory parts of the Open Water, Advanced, Rescue and Divemaster courses. This can be completed before you arrive saving you time on your well-deserved holiday. 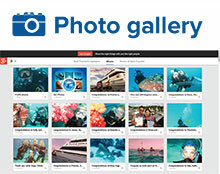 Click below for PADI Elearning. Blue Dive have expanded and are now offering small group and privately guided rainforest and wildlife tours, led by professional and friendly guides. Why choose a Blue Adventures Rainforest and Wildlife tour? Over the years we have spoken with thousands of visitors to Port Douglas who have completed rainforest tours and the most common feedback we hear is “the rainforest was beautiful but we didn’t see any animals”. Blue Adventures takes a different approach and our tours have a real focus on the native wildlife of far north Queensland. 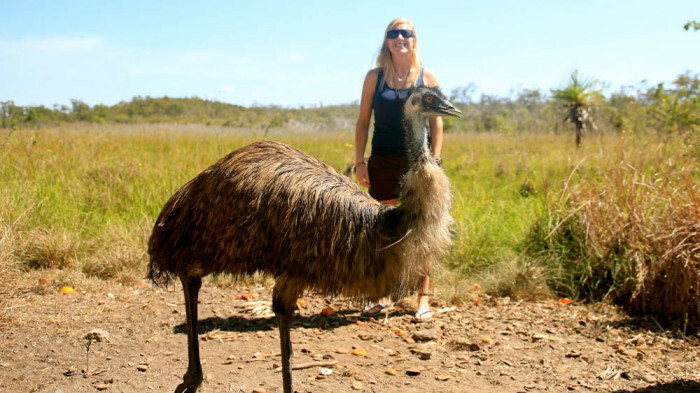 Join a Blue Adventures Tour and see – in their natural habitat – emus, an abundance of kangaroos and wallabies, incredible bird life, frill-necked lizards and much more. We never know what else we will see on these tours, that’s part of the fun…but the areas we visit also contain populations of very rare tree kangaroos and the elusive duck-billed platypus. On our tours we explore World Heritage rainforest, cruise on outback wetlands and enjoy a delicious lakeside restaurant lunch in the rainforest. Lunch and drinks included. Our small group trips take a maximum of just 6 guests and run Monday, Wednesday and Friday. Private trips can be arranged for most group sizes and are run on demand. Read more about our wildlife tours and rainforest tours on the Blue Adventures website. “Best and most pristine examples of coral on the Great Barrier Reef” (Port Douglas reefs) – Source: The Great Barrier Reef Marine Park Authority recent report.